As the commercial hub for Topsail Island, Surf City is known for the unique boutiques, galleries and restaurants that line its downtown area as well as the numerous concerts and festivals hosted throughout the year. The Surf City Swing Bridge connects Topsail Island to the Mainland. Approximately 1400 residents enjoy Surf City's laid-back beach town lifestyle year-round, while thousands more stay for the winter - or just a vacation. With more than 6 miles of beaches and numerous parks and trails, Surf City promotes an outdoor lifestyle that includes canoeing, swimming, hiking, biking, or simply basking in the sun. Surf City Ocean Pier is a prime fishing spot. Surf City real estate consists mainly of single family beach homes and cottages catering to year-round residents, retirees, snowbirders and vacationers. Searching for your Surf City dream home? You're in luck! We feature all available Surf City homes for sale in the MLS with the most current pricing, photos and property information available. You'll also find Surf City condos, waterfront properties, new construction and foreclosures for sale. Selling a Surf City home? Find out what your Surf City home is worth with a personalized property value assessment. Questions? Want to see a home in person? Contact us! 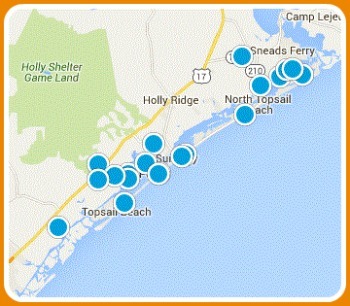 Be the first to see new Surf City homes as soon as they hit the market!